1). 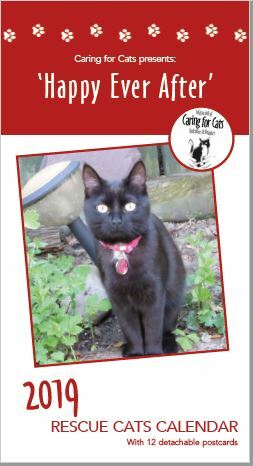 There are many indoor cats in the UK today and, if we home a cat or kitten to an address near a busy road, or some other evident risk, we would only do so if an undertaking was made to keep the cat as an ‘indoor cat’. 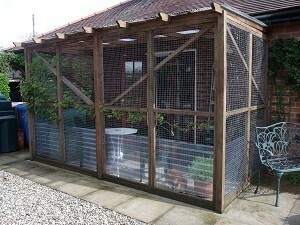 But there are ways to provide a limited, safer, ‘outdoor’ experience for your cat. 2). Building a small, secured cat run or ‘cat garden’ can offer your cat a safer outdoor experience, providing certain essential features are addressed. 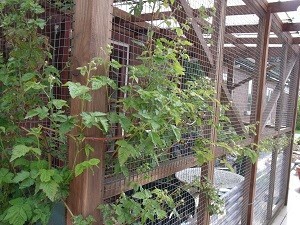 In this picture, a cat garden has been constructed over opening French windows, rather like a bird aviary, but a similar structure could be built away from the house if a short, safe, tunnel can be built to access it. The advantage of constructing a cat garden (of any size) against a house wall is the anchorage it provides and therefore the greater overall strength of the structure. 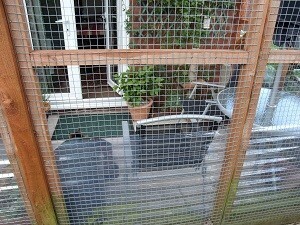 Because one side of the cat garden is provided by an existing wall, it also reduces the amount of materials needed. This cat garden (which is just an example,) measures 4.09m x 2.07m; its height is 2.30m to the bungalow eaves at the back, 2.25m at the front. 3). 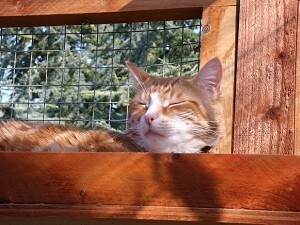 Inside a cat garden you can provide different levels; in this cat garden, nine simple, square shelves have been glued into slots, cut in diagonal timbers. 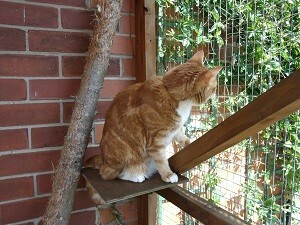 This has provided the cat with somewhere to run up and down or to sit and watch the world – especially the birds. You may be able to see, from picture 2 (above), that below these shelves a garden storage box, a seat, and (a now-anchored!) garden table give the cat easy access to the lowest shelves. Cats do get injured jumping down onto a hard surface so please design a stepped-route with this concern in mind. 4). Although smoother, planed wood was used for the cat’s running lengths, rougher, 2×2 tanalized timbers can be used to construct timber frames which may be exposed to the weather and less protected by the roof. This picture shows how the welded wire mesh can be tacked onto these frames. Tanalized fence posts have then been used as uprights and, for security, the panels have then been screwed-together on the inside, there are no screws showing on the exterior. Regrettably, nothing is burglar/vandal-proof but it is worth taking every precaution. Remember that wood treatments are poisonous so do not allow your cat access to the cat garden until any treatments have dried thoroughly. 6). A SPIT SCREEN – this is really important! 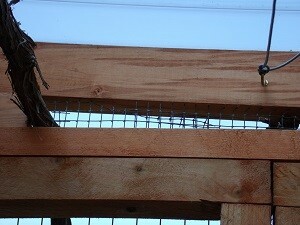 Please notice the vertical, corrugated PVCu sheets which have been screwed onto the timbers, around the bottom of the wire mesh; this makes a ‘spit-screen’ and is essential to protect your cat from the saliva of other, passing, cats. Saliva has the potential to transfer diseases – and other cats will pass-by. Both they, and your cat, will naturally be territorial – so there will be tension, thick tails, noise – and spitting! We wonder if this PVCu spit-screen might slightly impair visibility at ground level and so reduce the frequency of conflicts? It certainly protects from saliva which has the potential to carry even fatal disease. 7). 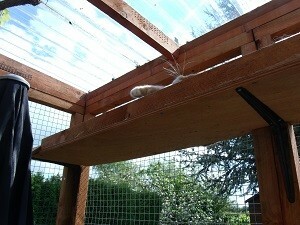 This worked for one of our contributors; their exposed cat garden repeatedly lost its roof in high winds! The owners found that curving the PVCu over on the windy south-west side has protected it; the cat garden in picture 1 had no such problems and the roof has been on, without problem, for 7 years! A roof is essential or your cat will simply climb out! PVCu sheets are just one suggestion but we like them; they protect the timbers from rain, are lightweight, and let in the light. After several years, they will suddenly go brittle and need replacing. PVCu is available from many builders merchants. These 2.4m lengths are from Wickes; don’t forget the PVCu corrugated fittings too! 8). It really is vital to secure every opening into your cat garden; birds will find their way in through the tiniest holes but will not find their way out again. 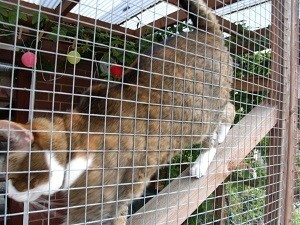 Kittens similarly can find the tiniest holes and both kittens and some cats climb the mesh! Many people find that wrens enter the cat garden through the mesh – but they can exit in the same way (providing nobody with big paws sees them first!). 9). 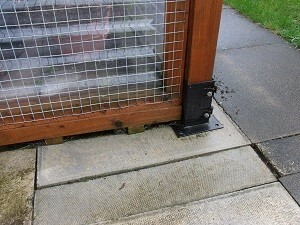 The base of this cat garden has been held off the ground to keep the timbers dry (unlike those in picture 2). The consequence of this elevation was that frogs and small mammals could still enter. To resolve this, (old/reclaimed) tanalized fence posts and bricks were laid against this base, along the inside. 10). While remembering that so many plants are poisonous to cats, it is great if the cat garden can be shaded by something leafy and relatively vigorous. This is a thornless blackberry which, usefully, fruits! 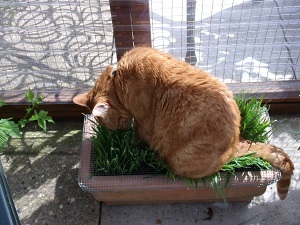 11) AVENA SATIVA (or ‘Cat Grass’) is safe for your cat! This is simply an ‘oat’ but it offers your cat one of the most comfortable blades to chew on. 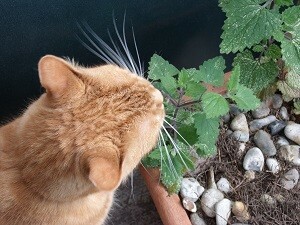 Cats actually seem to choose something a little ‘green and wispy’ so growing this annual, a few times each year, is really rewarding. 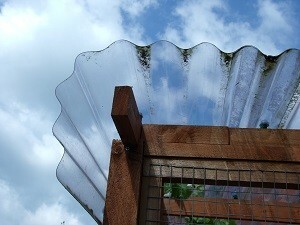 Do you notice that this planter has a mesh over? 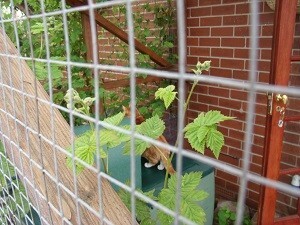 It protects the plants when ‘Old Ginger’ sits on them and it prevents him thinking this is a litter tray! Seed packets of Cat Grass (Avena sativa) are on sale at our charity shop or at our Homing Centre and are sold by many seed merchants, including Mr Fothergill’s Seeds. 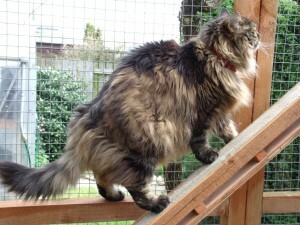 12) Inside the cat garden, the angle at which timbers are installed is critical; your cat will help you to get this right – he or she will only use the ones you get right and ignore the ones you get wrong! Planed wood has been used here. You might want to remember that people who also use this cat garden can bump their heads on the shelves; either warn them – or site your shelves, and seats, thoughtfully! 13). Here, the owner originally constructed a little ‘ladder’, a length of timber with cross-timbers, which was ‘romantic’ but totally unsuccessful. 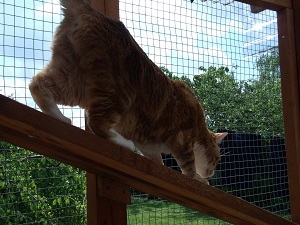 The cross bars simply presented obstacles to the cat – they don’t walk like we do! After a continuous (2×4) timber was screwed ever the top of the ‘ladder’, the cat could better use the access – but it’s not perfect because this one still proves just too steep for this particular cat. 14). Here, a tree trunk has been secured to provide a scratching post. It is too steep for cats to use as an access to that first shelf, although this youngster can run up it, with the wind in his tail, when the mood takes him! 15). 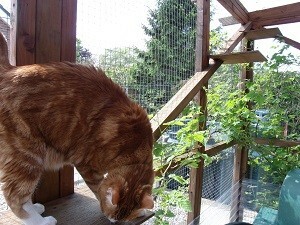 In this cat garden, gradual access is provided by two (2×2) timbers (side-by-side). This cat garden has just two shelves, and this is his access between them. One shelf is on the east side, one on the south side (so at right angles). Each shelf measures about 2m x 30cm. The lowest shelf is at 1m20 high (that’s about 4′), the other is at 1.70m high (that’s about 5’ 7″). They have been constantly used by this young ginger. Access, for the cat, to the lowest shelf, is from a garden bench – so reducing the risk that jumping any distance, onto concrete, poses. 16). 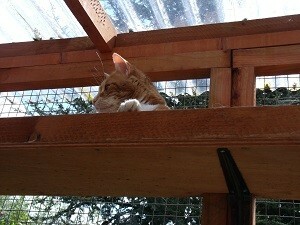 This is the high shelf, at 1.70m, it allows Ginger to lie in the sun, warm under the PVCu roof, and watch the world! Remember that cats with white ears need high-factor sun block; in the charity, our coordinator uses fragrance-free ‘Uvistat’. This shelf has a 5cm upright screwed to the front; it prevents the cat from falling off when he sleeps and provides a degree of ‘secrecy’ for him. Importantly, it discourages him from jumping down – much too far to safely jump onto concrete!! Notice that simple, strong, shelf brackets have been used to support these shelves. 17). Sometimes, just a roll on some concrete is good enough – and we do recommend that a cat garden is either flagged or concreted unless you are happy to have digging! 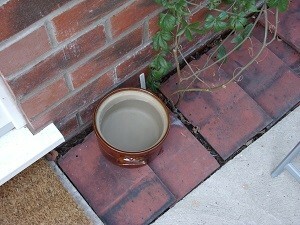 Any flower pot or small area of soil – will be used as a toilet! Unless you can guarantee that your cat can retreat, back into the house, from the cat garden at all times (usually only possible if you have a cat flap), please make sure that there is always an area of cool shade in your cat garden – as well as some shelter for windy, colder weather (in this cat garden you may notice a plastic cat kennel), just in case the house door might be closed for short periods. 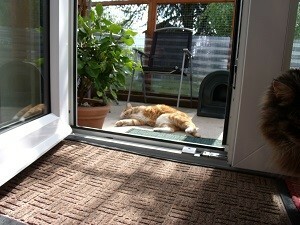 Again, access through a cat-flap would resolve that problem (providing that your cat can use the cat flap!). There are deckchairs in this cat garden because this boy’s retired (and devoted) owner spends a lot of time sitting outside with him! 19). For health reasons, it is really important that cats and kittens have access to clean water at all times – so, if you intend to close the door, even briefly, please make sure that your cat garden has a bowl of clean water. Water needs to be replenished daily, placed in the shade, and in a heavy container that cannot be knocked over. Here an old casserole dish has been used. 20). This young ginger-and-white has rewarded everybody’s efforts to build him a cat garden, simply by the time he spends in it.